As we approach the finishing line with most of the team in place, we come down to the last couple of positions: the front line. Do I go for a modern trequartista and a poacher or perhaps a false nine tucked in behind a speedy forager, or the more traditional little and large combo so popular in the seventies and eighties ? To be honest with this line-up it doesn’t really matter because nobody could live with them anyway. You could stick Cruyff at right back and Cafu on the left wing and they’d still do a world class job. My Top 4 strikers … Ever. More than just a goal-scorer and more than just a world-class player, Raul was the talisman and focus of the Spanish national side for a generation .. it’s just a shame it was the generation before they finally realised their potential, though imagining him playing alongside the likes of Xavi, Iniesta and David Villa is actually quite a frightening thought for the rest of the football world, so maybe it’s just as well. A poacher who could also play a bit, Raul combined a turn of pace with lightning reflexes and better vision than he’s often credited for. He played up top on his own for many years and was as adept at bringing others into play as obviously being an all-time great goal-scorer. For Real Madrid: 6 x La Liga winner, 3 x Champions League winner, 4 x Spanish Cup winner … all that and not a single red card in a career that started in 1994 and is now in its twentieth year as El Ángel de Madrid continues to turn out for Al Sadd in Qatar at the grand old age of 36. Kenneth Mathieson Dalglish MBE has enjoyed a long and highly successful career in football. 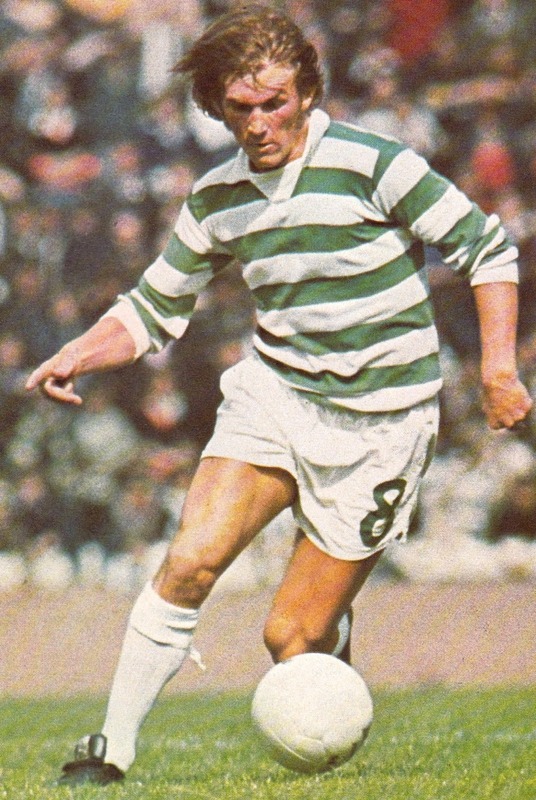 Starting out at Celtic in 1969, where he won four league titles and four SFA Cups (including three doubles) before moving on to Liverpool to replace Kevin Keegan after the diminutive Englishman left for the bright lights of Hamburg. Reds fans worried about losing their best player needn’t have worried: Dalglish became the second most influential figure of all time at Anfield, only pipped to the title by a certain Bill Shankly. As a Liverpool player he went on to win a whopping six league titles, two FA Cups, four League Cups and a glorious trio of European Cups in 1978, 1981 and 1984, before going on to notch a further three league first division titles another League Cup and two more FA Cups as manager of the club. He also won the league as Blackburn manager and the Scottish League Cup in a brief spell as Celtic manager. Often dour and unfathomable as the boss, he was nothing less than magical as a player. With a distinctive shuffling style and a talent for winning important free-kicks and penalties with his backside, it was perhaps Dalglish’s vision and ability to bring others into the game as much as his superlative finishing that marked him out from other players of his generation. With over 800 first class appearances and well over 300 goals, he remains Scotland’s record appearance maker (102 caps) and their top scorer with 30 goals. 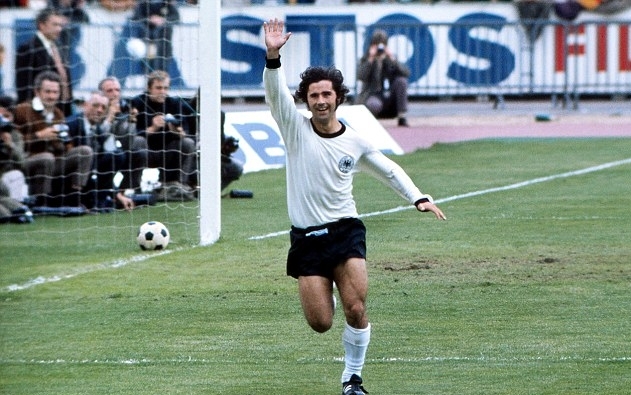 If ever you needed someone to score a goal if your life depended on it, Gerd Müller would be the choice of a generation. Perhaps the most natural goalscorer of all time, he made West Germany a great side years before they really became one and was at times more like a force of nature than a footballer. With the unfortunate yet wholly appropriate nickname of Der Bomber, he nevertheless was a one-man assault team both for FC Bayern and the national team. With the absolutely astonishing strike rate of 655 goals in just 709 first class appearances he seemed more like a throwback to the “goalden” days of old when he burst on to the scene, evoking the likes of Dixie Dean and Gunnar Nordahl. Yet, a look through the history books will reveal several “freakish” goal-scorers down the years including the likes of Cristiano Ronaldo and Lionel Messi in the modern age, Clive Allen’s remarkable 49-goal season in the late 80s with Spurs, Jimmy Greaves in the 60s, and Müller was just another one in a long line … but he was the best and it’s doubtful anyone in the current era will eclipse his national scoring record of 68 goals in 62 games: it’s taken Miroslav Klose 130 caps to reach the same number of goals. “Of all the greats such as Wolfgang Overath, Günther Netzer, Karl-Heinz Rummenigge and Paul Breitner, I believe Gerd Muller is the greatest of them all. He was unstoppable. Bayern have Gerd Müller to thank for what the club has become.Without Gerd’s goals, we’d still be sitting in a wood hut“. As with a few other positions in this team, there could really be no other choice for me. 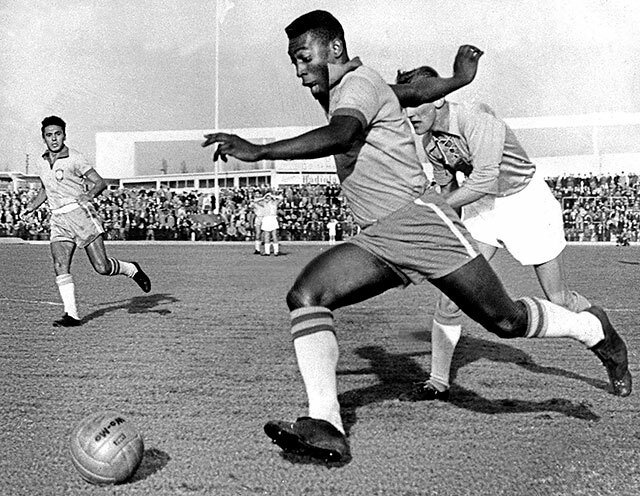 For many the greatest player that ever lived, Pele is the embodiment of all that’s good about the game, forever playing with a smile on his face no matter how many kicks to the shin. And what a smile ! 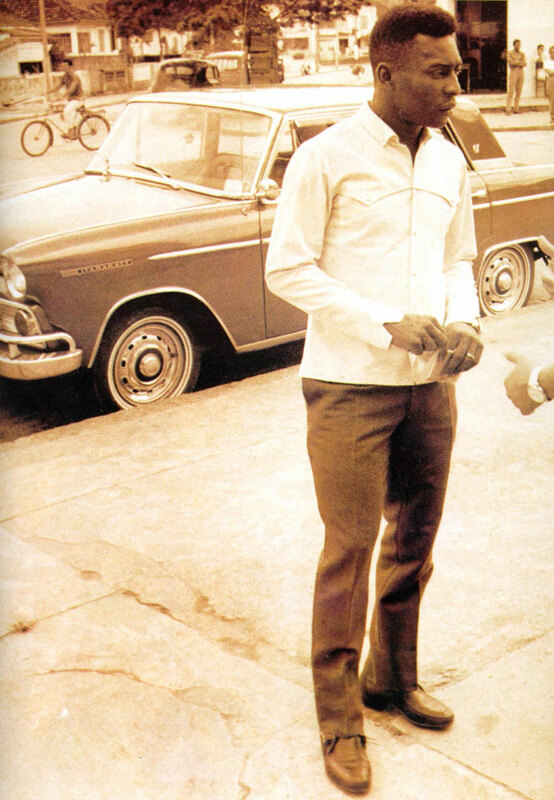 Now selling Viagra with it, Edson Arantes do Nascimento hasn’t done too badly, has he ? Starting out with Santos, for whom he played for nearly twenty years, he forged a stellar career amassing a bonkers number of goals and trophies along the way, lighting up three glorious World Cups (he was also kicked out of a fourth in 1966, finally succumbing to a defender’s wrath), before finally helping establish soccer in the US with the Cosmos in the mid-70s. Pele is right up there with Elvis Presley, Gandhi, Michael Jackson and The Queen in being instantly recognisable all over the world and adored by millions. 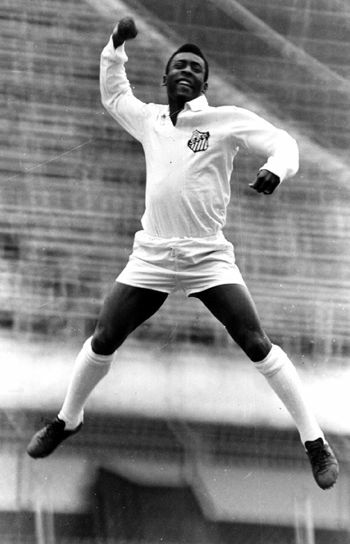 With a strikerate to rival all those mentioned above, Pele netted 1282 goals in 1366 matches, though some say many of the appearances for Santos were friendlies and therefore shouldn’t count. Even if that is the case, 95 in 113 for Brazil isn’t too shabby. Not only that, but he also starred in the only football film worth watching Escape To Victory alongside other legends like Bobby Moore, Michael Caine, Sylvester Stallone and .. er .. Russell Osman. Honours include three World Cups for Brazil (1958,1962 and 1970) and … well, countless others. But it’s not about the silverware and the medals. We’re talking about a cultural icon. A man who transcends mere sport. A man who is the face of football for many and a symbol for social change for yet more. The most significant black athlete since Jesse Owens. The most supremely gifted footballer of all-time. A player who would’ve been the best right-back of all time, the best left-winger of all time and probably the best goalie of all time if he’d decided that’s what he wanted to do. Only Maradona can compare … everyone else is below their elite level. Honourable mentions: Jimmy Greaves, Just Fontaine, Paolo Rossi, Jurgen Klinsmann, Thierry Henry, Romario, Denis Law … and Gary Lineker.